Ray Rundelli is a Partner with Calfee's Intellectual Property practice; he has a broad range of experience in all aspects of trademark, copyright and unfair competition matters. Ray has prosecuted numerous trademark and copyright applications and represented many clients in proceedings before the Trademark Trial and Appeal Board and the U.S. Customs Service. He also counsels clients on the acquisition, clearance, maintenance, licensing, enforcement and transfer of intellectual property rights and Internet domain names. Ray’s intellectual property litigation experience includes numerous appearances as lead counsel in civil actions and/or appeals of trademark, copyright, false advertising, counterfeiting and unfair competition matters in federal courts across the United States and before various federal agencies. 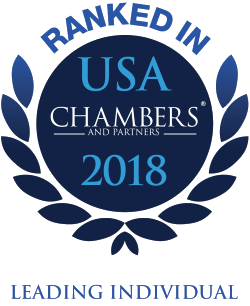 Ray is ranked as one of "America’s Leading Lawyers" in Chambers USA 2018 for Intellectual Property. Chambers researchers reported in 2018: "Raymond Rundelli has a broad IP practice which incorporates IP licensing and enforcement, as well as prosecution of trademarks and copyright applications before the Trademark Trial and Appeal Board (TTAB). [He] offers additional expertise in false advertising, unfair competition and counterfeiting disputes." He is listed in World Trademark Review’s WTR 1000 – The World’s Leading Trademark Professionals (2015-2018). Ray was named to the Ohio Super Lawyers list from 2013-2016. He is the firm’s designee for its long-standing membership in the International Trademark Association. Ray is also a member and past officer of the Cleveland Intellectual Property Association. He has served on the Board of Trustees for the Geauga County Public Library since 2006 and has been elected Board President four times. Ray was an associate with the law firm of Baker & Hostetler from 1985 to 1993 and a partner with the firm from 1993 to 1998. He joined the firm of Benesch, Friedlander, Coplan & Aronoff as a partner in 1998 before joining Arter & Hadden in 1999. Ray began his tenure with Calfee as a partner in 2001. "Raymond Rundelli has a broad IP practice which incorporates IP licensing and enforcement, as well as prosecution of trademarks and copyright applications before the Trademark Trial and Appeal Board (TTAB). [He] offers additional expertise in false advertising, unfair competition and counterfeiting disputes."